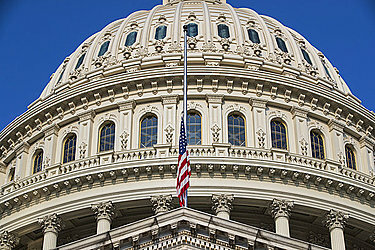 WASHINGTON (AP) — Flags at the White House were back at full-staff Monday, even as objections mounted and Senate leaders of both parties formally requested that American flags at government buildings stay at half-staff to honor Sen. John McCain. President Donald Trump also passed up several chances to comment on McCain, with whom he had frequently traded criticism. The flags at the White House had been lowered a day earlier but were back up on Monday in a break with tradition. That brought complaints from both right and left, including the America Legion. That's standard procedure when a member of the Senate passes away. McCain served in the chamber for six terms, most recently as chairman of the Armed Services Committee. McCain died on Saturday at 81 after a 13-month struggle with brain cancer. Trump tweeted condolences to McCain's family but made no reference to the Arizona senator.